A distant star that is approximately 570 light years from the earth is the major center of attention. The incident might not be anything close to the destruction of Alderaan that was laser zapped, but it certainly got the attention of scientists from Harvard. According to the study done by the scientists from Harvard, Virgo is slowly causing destruction of the planetary object that is located in its orbit. Andrew Vanderbug studied the data that were collected by NASA during the NASA’s Kepler K2 mission. He notes, that’s this is the first time the white dwarf star was captured as it destroyed other minor planets and states that the study brings to light what is feared to as the smoking gun. The smoking gun theory clears the mystery that is surrounded by heavy metal pollution present in white dwarfs. The star is the size of the earth’s core, the pollution occurs at the end of the star’s life cycle after the red giant phase. The six years old telescope from Kepler was used during the K2 mission to collect data. The data collected was in the form of light and brightness of the star, supernovas, order of the stars, and the nearby objects in the universe. The Harvard team of scientists was able to notice a dip in the brightness that occurred every 4.5 hours, this was noted when parsing the data. When an object is orbiting the star there is always a regular clockwise like a dip in the brightness. This was the first time astronomers were able to observe a planetary object transiting the white dwarf. The object is estimated to be 520000 miles from the star which is practically twice the distance from the earth to the moon. Signs of other larger material whose total mass was similar to the mass of Ceres were discovered when the team made more observations using different instruments. These objects were noted to be regularly orbiting the dwarf white star. There was also a cloud of dust that was similar to a comet’s tail. The white dwarf is simply a tiny ball that is ultra hot and is made up of carbon and oxygen. Several astronomers studying it have suggested that there is possible existence of metals like silicon and iron. This is because of its very small size, hence high gravity and so the heavy metals should not be there. If one should drop a heavy element into the white star it will quickly drop into the interior of the star and hence become invisible. The elements found on the surface of the star are still a mystery. 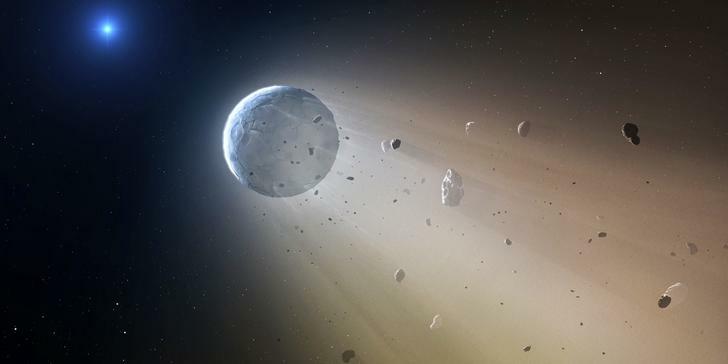 Suggested sources of heavy pollution on the planet are asteroids and nearby planets that are being consumed by the star. The new system observed tends to confirm this theory. Vanderburg notes that their paper could have collected direct evidence show that the pollution could be originating from the disintegration of the planets near the star. Almost a quarter of all white stars show these similar characteristics of heavy metal pollution. The study is still in its early stages and there us plenty of room for questions and clarifications. Hoping the study will provide an efficient way of astronomers handling questions related to the white stars.